Jurgen Klopp has praised Xherdan Shaqiri for settling so quickly after he scored during Liverpool’s 4-1 victory over Manchester United on Saturday night, according to quotes by TeamTalk. Shaqiri completed a £13m switch to Anfield from Stoke City earlier this month and met up with his new team mates during their pre-season tour of the United States last week after enjoying an extended break following his exploits at the World Cup this summer. The 26-year-old made his first appearance in a Liverpool shirt last night after coming off the bench at half-time to help the Merseysiders secure an impressive victory over United in the International Champions Cup. 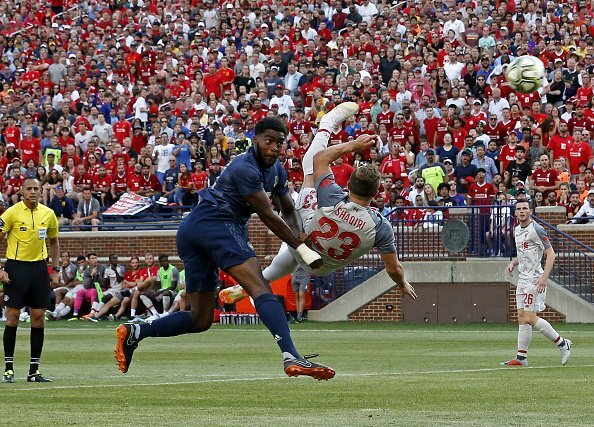 Shaqiri capped an excellent all-round performance with a stunning overhead kick goal in the 82nd minute to make it 4-1 having previously provided an assist for Daniel Sturridge in front of 101,000 fans at the Michigan Stadium. Klopp was asked about the Switzerland international’s performance after the game and the Liverpool boss claimed it wasn’t ‘normal’ for a player to produce that kind of display after just four days at the club. “It was good, obviously. That’s not normal after four days in the club — adapting that well to the style of play. “We wanted to help him a little bit with the position [so] that it’s not too complicated, gave him a lot of freedom, offensively playing natural, plus offering runs in behind, which is what he did especially around the Sturridge goal. Shaqiri’s performance was the icing on the cake for Liverpool following their impressive win over United. Sadio Mane opened the scoring from the penalty spot before Andreas Pereira levelled things up with a superb free kick. Shaqiri then set-up Sturridge to make it 2-1 in the 66th minute, Sheyi Ojo converted from the spot to make it 3-1 before Shaqiri wrapped things up with a stunning fourth late on.